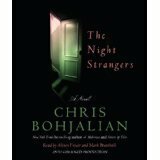 I finished The Night Strangers by Chris Bohjalian a couple of days ago and I'm still trying to digest it. He had me hooked until the finish and, well, I'm trying to make up my mind about that ending. Chip was a pilot who failed to land his plane in a lake. Thirty-nine people died. While the accident wasn't his fault, he can't live with his guilt. His wife, Emily, thinks it would be a good idea to move to New Hampshire, to a big Victorian house in the woods. The neighbours seem nice, if a little pushy and eccentric with their casseroles and obsessive gardening. Their twin girls are settling in, though they are having a hard time making friends. While Emily is getting into the swing of things at work, Chip is alone at home with the weird little door in the cellar...and the voices. The Night Strangers has a lot of things going on. There are three separate storylines: Chip and the plane, the house and its secrets, and the weird neighbours. I wondered how these stories were going to come together. They do, in a way. Some parts of the story take precedence, while the parts that seemed important in the beginning fade into the background. The tension Chris Bohjalian creates just about gave me heart palpitations. I had moments where I was thinking, "Nonononononononono!!!" There is so much that the reader knows that the characters do not. It's those "don't go in the basement" moments that were nearly the end of me. He used the second person narrative for Chip's thoughts and experiences. It puts the reader right into Chip's head, which is a messed up place to be. You are Chip and you really don't want to be, especially in that plane. In the interview at the end of the audiobook, the author describes how he spent the day in a flight simulator 'dunk tank,' which he said was both "terrifying and fun." Yeah, he's a little nuts maybe, but it helped him create the terrifying plane crash scenes. And poor Emily. I couldn't help but feel sorry for her. There she is, holding up the fort, while her husband is turning all Jack Nicholson. Then she's got these overly friendly elderly people showing up on her doorstep with offers of cookies and, hell, yes, take my daughters for the weekend, please! She's between a rock and a hard place. Who wouldn't take the help that's offered? Things got a little Vincent Price-esque at the end and I'll still wondering if it was a good ending or not but I really enjoyed this psychological horror story. It's a little bit Stephen King, a little bit Shirley Jackson. About the Audio: There are two narrators for The Night Strangers: Alison Fraser and Mark Bramhall. I was unsure about two narrators when I started listening to the book but now I feel it was a good choice. Since Chip's point of view is so unique, he really needed his own voice. Alison Fraser has amazing range. I totally believed she was a 10 year old girl, a thirty-something woman, or an 80+ lady. I'm very glad to have listened to the audiobook version. I'm a fan of both King and Jackson, so this sounds like a great read to me! The ending was definitely not what I was expecting, and the difference in tone was kind of hard to digest but in the end, I thought it was fitting. I hate when the ending messes up what was otherwise a wonderful book. I still want to read this one though, because I love Bohjalian's work. This sounds like a wonderful read. Your review made me empathetic for Emily and I haven't read it yet, so I can imagine how really good it must be. I look forward to reading it. I am planning on listening to this audiobook sometime this week. I'm glad you liked it. I JUST DOWNLOADED THIS ONE TODAY!!! And I'm a little excited about it... can you tell? :D Sounds creepalicious, and I can't wait to find out about that ending! I was happy with the ghost story part...was surprised it went the direction it did. I imagine it would be really creepy on audio! Especially that plane crash! I think I am going to read this. I haven't read anything by the author in ages and I have been hearing good things about this one. I'm so glad you enjoyed this one! I'm with you; still trying to decide how I feel about the ending! Thanks again for participating in Mx3!